When people first drive around the island of Maui, one question plagues them. This burning question has been asked decade after decade. Looking up the hill to see an Ulupalakua rainbow from Makena, on the South Shore. Ulupalakua is misty, hilly, and verdant. The question isn’t, “Why is there so much water around Maui?” or “Is Maui completely surrounded by water?” By the way, Maui is still an island at the time of this writing. Ulupalakua looks directly over Makena, which is part of Kihei. From Ulupalakua to Makena, there is a distance of less than 5 miles as the crow flies. But there is no public road that connects Ulupalakua to the South Shore. Instead one has to drive ALL the way north to Kahului and then back south to Kihei and Makena, a distance of 40 miles. It’s a significant amount of time and gas. Ulupalakua is pronounced, "Ooh (like in ooh la la) - loo - pah - lah - koo - ah" Make sure the loo, ooh, and koo rhyme. Actually there are private gated roads that go down the hill from Ulupalakua and Kula to Makena and Kihei, but they require keys or combinations. A few years ago, Oprah Winfrey built a private road to the South Shore from her private ranch Upcountry. It fanned the flames of this burning question. So why is there no road? The answer frequently given is that the landholders in Ulupalakua and nearby do not want the traffic, or the inevitable changes that a road will bring: more people, houses, and development. They want to keep Ulupalakua rural and protected from the commercial influences of tourism. Ulupalakua is beautiful, hilly, and usually green. One meaning of the name is “Ripe Breadfruit of the Gods.” Breadfruit or ulu is an abundant tree of life, and this section of Kula was sheltered from gusty winds, with rich, productive land. View from Ulupalakua looking towards West Maui. 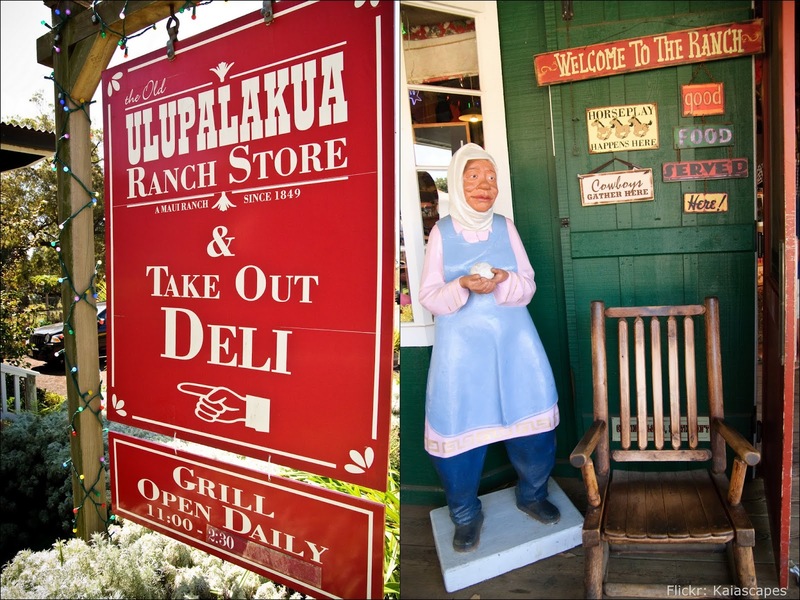 Today Ulupalakua is known for the Tedeschi Winery which successfully grows grapes on Maui and the Ulupalakua Ranch which raises cattle, and even elk. Both operate retail storefronts. Special events like holiday tree lighting, craft fairs, state chili cook-offs, and community festivals take place year-round in Ulupalakua. Ulupalakua doesn’t mind tourists or visitors – it just wants to control the quality and quantity of them. Ulupalakua also has two important cultural and environmental sites. The D.T. Fleming Arboretum preserves a large collection of native Hawaiian plants, including many rare species. The Auwahi Forest is a protected section of land being restored with native plants through monthly volunteer planting and weeding projects. So perhaps the people of Ulupalakua are wise to keep their land sheltered from too much traffic and change.